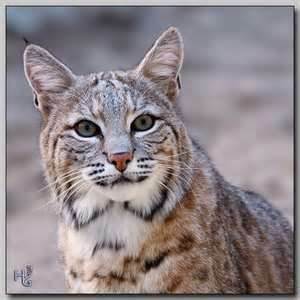 The bobcat is a medium sized member of the North American cat family, also referred to as the "wildcat". Two to three times the size of a domestic cat with faint or distinct spots, round face, short ears, proportionatley long back legs, and a "bobbed" tail. Adults can range from 28 to 40 inches long and from 9 to 40 lbs, with males being the on the larger end of the spectrum. Capable of hunting and killing prey from mice to deer. Diet mostly comprised of rabbits, tree squirrels, ground squirrels, rats, pocket gophers, moles, racoons, frogs, and lizards. Will occasionallly scavenge. Breeding occurs from January to June with litters born 62 days later. Litters are 2 to 4 kittens. Mostly nocturnal but will hunt at daytime if needed. Commonly moves 1 to 4 miles daily. with territory home ranges between 5/8 to 42 square miles. Like most members of the cat family, it will cover killed prey with grass, leaves, soil, and small sticks it reaches out 15 inches from the prey. It will also mark territory with scratch poles and urine markings. 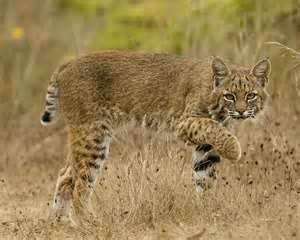 Opportunistic predators, they will kill small pets and livestock, including poultry. Be extremely careful of small pets being outside alone in heavily wooded areas, especially at night. 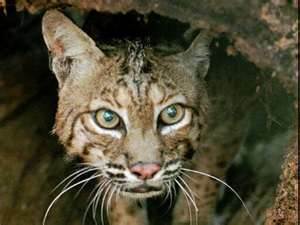 Bobcat trapping is skill set sensitive and if not done properly will educate bobcats to stay away from traps making it harder to catch them in the future. 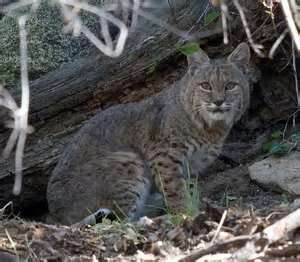 Have you seen bobcats on your property? Something killed your pet or livestock? IN NEIGHBORHOODS, IF YOU SEE ONE NEAR YOUR HOME, CALL IMMEDIATELY!